Okay, I'm not actually at TEDActive. Sadly. But some extremely talented friends of mine are and they've asked me to post their daily musings on my blog so you guys can share in their awesomeness. I'm really proud and envious of them (bastards), but that's for a case of beer to sort out. That said and without further adieu... Heeeeeeeeeeere's Frankie! TEDActive 2013. The Young, the wise, the undiscovered. The Arrival. First of all I'd like to thank the Pendoring Awards for making this trip possible. After winning their Grand Prix with our MK IS project, we (my colleague James Yeats Smith and myself; Frank van Rooijen) decided we wanted to spend our prize money on a trip to TEDActive 2013 in Palm Springs, California. After flying into Los Angeles from Johannesburg (a mere 22 hours of inflight entertainment and plane aerobics away), a party at Hollywood's Superclub Avalon, escaping arrest after taking some illegal pictures of the Oscars stage build up, an Amtrak train trip and bus ride we finally arrive in Palm Springs for the TEDActive 2013 conference at the beautiful La Quinta resort. We decide to register and get our TED goodie bags filled with a thermo TED water bottle, iPhone cover, a fluffy tiger toy, Moleskine diary and more useful gadgets, the opening of the TED Goodie bag can be best described as Coca Cola's payoff line: Open Happiness. That night we meet some other interesting TED attendees, discuss and share creative ideas over dinner and cocktails Tom Cruise would be jealous of and we invite each other on TEDActive's amazing conference app. After a good night's rest we arrive at the pool breakfast brainstorm of our TEDActive Future of mobile workgroup brought together by Intel. As you can see on the picture there are worse places on earth to brainstorm. 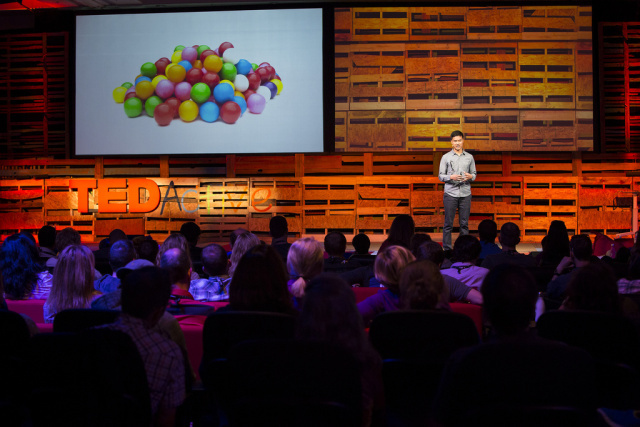 Our TEDActive Mobile group consists of 20 smart people carefully selected from all parts of the world. After initial introductions and breakfast we get straight into the brainstorm. Some of the questions we asked ourselves were: How might we improve people's lives with mobile technology? How might mobile technology enhance the experience of where I am at the moment? And how might we design a mobile Eco system with device independence in mind and what would the content strategy look like for such a system? After a group brainstorm we decided to breakaway into smaller brainstorm groups. I decided to brainstorm on the "No device, just content" subject. Do we really need a mobile device in our lives? If yes, can this device have a different look and and feel? What would it look like and what would I like it to be able to do? What would it be called? How can we monetize it? Our group came up with some really interesting ideas and concepts that we shall develop more in-depth during this week after which we shall share our ideas with the Intel representatives present and see how we can realize the ideas and bring them to life. The Lab, a fully equipped workspace open for TEDActive attendees turns out to be one of our favorite hangouts. Explosions of creative genius are shown by Paper Punk, Hit n Run and Fallen Fruit. To add some swag to our appearance at TEDActive we opt for our Radio Flyer scooters as our preferred mode of transport around the TED campus. Next to brainstorming we also did an amazing amount of networking. One of the great things of TEDActive is that everyone talks to everyone about ideas they have and thus far we have already made some friends with TED attendees (most of them TEDx organisers themselves) from Colombia, New York, Bermuda, the UK and Canada to just name a few.